A space ship plummets into earth near the Statue of Liberty and the sole occupant escapes with his life. His right foot is missing but this runaway slave from another planet has an uncanny power to mend things. With just the touch of his hand, he restores his three-toed foot – complete with its gnarly claws – and starts wandering the streets of Harlem. On the surface he looks just like every other African American resident. The only difference (apart from his feet which he keeps well hidden) is his inability to speak, and, of course this power he has to fix broken objects like computer games and pin-ball machines. Writer/director John Sayles plugs directly into the mood of an alienated mid ’80s New York sub- culture with this kooky sci-fi film about an outsider searching for safety in a world gone haywire. He also makes a strong impression alongside David Strathairn as one of two bounty hunters on the trail of The Brother in a double act that would later provide a template for the 1997 hit Men In Black. While our mute hero dodges the strangely synchronised pair he experiences love with a sassy jazz diva (the Grammy Award winning Dee Dee Bridgewater) and black American history with a young boy who relates to him in much the same unprejudiced way as Elliot connected with the extraterrestrial in E.T. 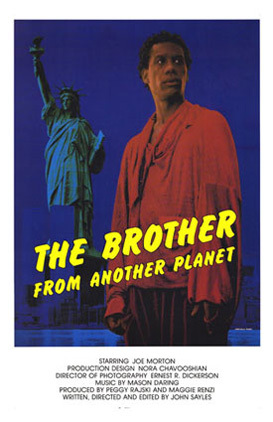 In one of the trippiest moments in the film, the eponymous Brother (played Joe Morton) removes a needle from a dead junkie’s arm and injects himself with the remnants before embarking on an odyssey through ‘Babylon’ with a smooth talking Rasta Man. It’s a low budget time capsule that, with its fashions, music and plot-line, sums up the period and the place with a big heart and more than a touch of humour too.